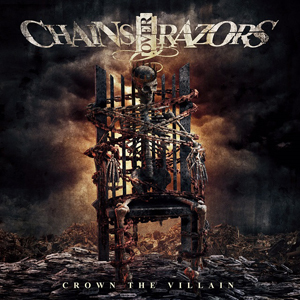 Newcomer hard rock trio CHAINS OVER RAZORS have released a music video for the track "Damnation", which is featured on their debut offering, Crown The Villain. And despite two of its members being based in Chicago and one in Montreal, all are fully committed to the band, and will not let a little distance get in their way of success. And they certainly have the tunes to accomplish this, as heard by such ragers as "The Center Line Of A Lie", "Devil's Eyes" and "Damnation". "An assault of pure madness," is how Franco describes COR's sound. "This record is a heavy hitting face smasher," adds Mikey. "I can't wait to get this record into the world's hands and perform these songs live." And lastly, Andy describes Crown The Villain as "An adrenaline, frenzied, melodic hard rock album. The unexpected twists within the compositions progressively moves the songs forward to tell the story."